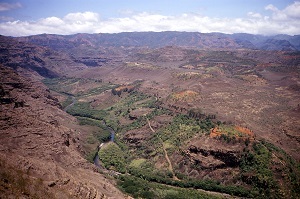 On your way to Waimea Canyon, make a stop in Waimea Town on the West Side. This historic seaport town can be found not far from where British discoverer Captain James Cook first landed in Hawaii in 1778. A statue of Captain Cook can be found in the center of town, a replica of the original statue found in Whitby England. This local community is home to a variety of small shops and businesses as well as a growing number of high-tech companies. While you’re in Waimea Town, stop by the West Kauai Technology & Visitor Center, a great place to learn more about Kauai’s past. The center features exhibits, programs and weekly activities that reflect the diversity of Kauai’s agricultural community. Call for more information, registration required. Along with Hanapepe, Waimea Town is an off-the-beaten-path discovery that’s a great place to stop as you explore Kauai’s West Side.